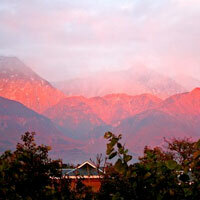 Dharamsala was recognized s headquarter of Kangra District in march 1855. Lying on a Dhauladhar spur, from a War Memorial monument at 1300 meters to Mc Leod Ganj at an altitude of 1770 meters , spread over an 8 kilometer rising slope the place has a district character. 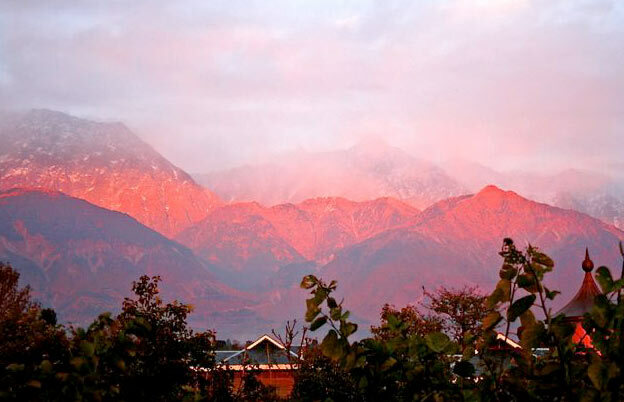 Lower Dharamsala houses shopping complexes and the upper regions consisting of Forsythe Ganj and Mc Leod Ganj retain colonial township flavors. Mc Leod Ganj gained new appeal with the arrival of His Holiness Dalai Lama in 1966. Mc Leod Ganj (1770 m): Rose to prominence when His Holiness The Dalai Lama, spiritual leader of the Tibetans made it his refuge after leaving Tibet. Nicknamed little Lhasa, traditional Tibetan medicine and Handi craft here are great attractions. After breakfast proceed to The Yatri Niwas, Chamundaji. Lunch, evening tea and over night stay at The Yatri Niwas, Chamundaji. Chamundaji: Chamundaji is a famous pilgrimage place where many descend to pay obeisance to the presiding goddess. With Dhuladhar ranges sheltering the temple complex on three sides, the fourth one opens out into a wooded valley with scenic settings. A temple dedicated to warring deity Chamundaji is located on the right bank of river Baner (also called Banganga), a tributary of river Beas. Holy waters of Baner have been converged into a man made bathing ghat for pilgrims to take a holy dip in. A temple glorifying Lord Shiva as Nandikeshwar in the temple complex is equally revered. If Hotels / Resorts mentioned are not available similar hotels / resorts will be provided. The cost is subjected to change without prior notice.